A moon-like light fixture and the subtle sparkle of the wall covering and a tiled wall brighten this windowless powder room. 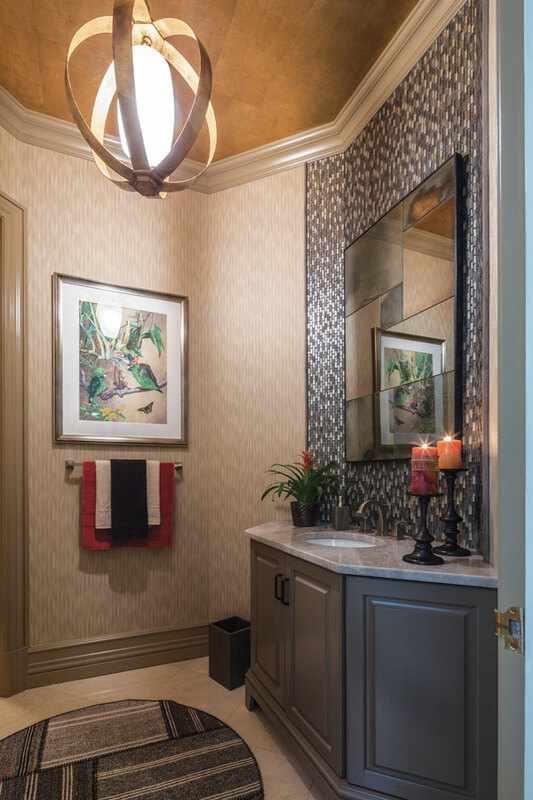 An unusually shaped powder room with no windows creates a design challenge. Imagine stargazing on a moonlit night. The stars twinkle overhead, the moon casts a subtle glow and textures are enhanced in the soft light. That’s what Sharon Sherman imagined when designing a powder room at the 2015 Designer Showhouse of New Jersey. “It was a challenge because the room has an octagon shape and lacks natural light,” says Sherman, a state-certified interior designer, professional member of the American Society of Interior Designers, Certified Kitchen Designer and owner of Thyme & Place Design LLC and Thymeless Home Décor in Wyckoff, NJ. She chose a light fixture with an open metal framework that glows like a full moon. Then she added a wall covering with a bit of star-like sparkle. For texture and to turn the room’s challenging angles into an advantage, she ran small subway tile in a combination of slate, glass and reflective metallic silver vertically on the sink vanity wall, reminding her of falling water. Sherman used the existing vanity, which has an angled back to fit the walls, but added a furniture-detail base, painted it taupe and changed the hardware to a contemporary matte black pull. A wave-pattern wall covering elsewhere in the room adds visual interest and leads the eye up to the ceiling, which is covered in a bronze wallpaper with a feel similar to the light fixture. 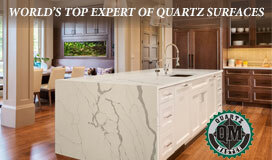 The Taj Mahal quartzite countertop has a backlit feel, adding to the feeling of basking in the glow of the moon.